Essentially Vietnam’s national dish, this noodle dish is served in a delicious, savory slow cooked broth of soup bones, ginger, and various spices. Usually a choice between thinly cut slices of beef or chicken, this is definitely the dish to judge any Vietnamese restaurant on. You should look for a hot (as in fresh off the stove) sweet, savory broth. Cold broth’s are an instant no-no! Garnish with fresh bean sprouts and fragrant basil for a comforting dish at any time of day. Pho, though simple in principle, easily is one of the hardest dishes to make and compare. No one person does it the same way, using different spices, seasonings, and even methods. 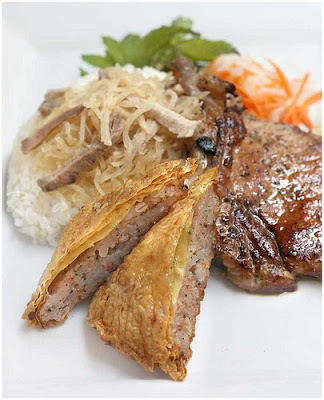 Some even have paid thousands for an award-winning recipe for their restaurants.Fun fact: Pho is traditionally a breakfast item in Vietnam.”Bun Thit Nuong”, pasta the Vietnamese way. 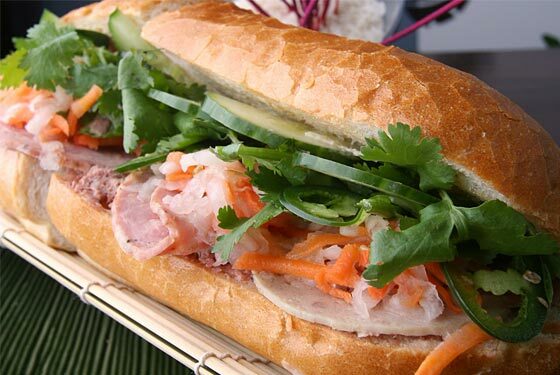 It’s sweet, it’s sour, it’s salty, savory, fresh, crispy, and crunchy, a Vietnamese sandwich is just everything you look for in a great sandwich. It starts with a smear of pate on one side of a beautiful baguette, and then a slatter of butter on the other end. In goes various Asian cold cuts, including pork belly and Vietnamese ham, followed by a volley of veggies including the carrot/daikon mixture, cilantro, and a few jalapeno slices. Sometimes grilled pork is used instead in all its glory. Either way you serve this dish up, it’s a real eye-catcher.It can be a little tricky to find though. In the United States, they often are best out of sandwich shops rather than restaurants.”Com Tam”, the national rice dish.